Nothing says summer like S'MORES! 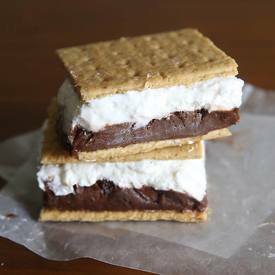 But, sometimes you just want the flavors of a s’more without the work (or heat) of a campfire, right? These frozen s’mores are the perfect treat for a hot summer day because you get all the chocolate/marshmallow/graham cracker taste in a cold refreshing format. These frozen chocolate pudding and marshmallow sandwiches from It's Always Autumn are easy to make ahead and keep in the freezer!